Embry-Riddle Aeronautical University is a fully accredited private nonprofit university with residential campuses in Prescott, Arizona, and Daytona Beach, Florida, as well as a Worldwide Division with more than 100 learning centers and online studies; serving students at every stage of education from summer camps to professional programs, in the classroom and online, from veteran’s to athletes, first generation to career changers. As the nation’s only university specializing in every aspect of the aviation and aerospace fields, Embry-Riddle produces students and graduates that employers seek out for in-demand careers, from professional pilots to pre-med, engineering to intelligence operations, and everything in between. 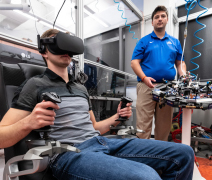 Offering one-of-a-kind majors in Space Physics; Simulation Science, Games, and Animation; Forensic Studies; and many more, Embry-Riddle is preparing students for the critical needs of industry today as well as the careers of tomorrow. Hands-on learning exposes students to opportunities that mimic industry operations, like launching a “CubeSat” into space and writing award-winning code that could revolutionize drone operations. Alumni around the globe create a support network made up of CEOs, engineers, air traffic controllers, military leaders, and astronauts working for the leaders of industry, including NASA; the Boeing Company; SpaceX; Lockheed Martin; major airlines; government entities like the NTSB, FBI, and CIA; and many more. The national shortage of pilots and aircraft mechanics dominates the news, and for every pilot or mechanic, dozens of other professionals are needed to support operations. Managing the business side, securing the safety of employees and the public, analyzing the weather, monitoring air traffic, and engineering the systems that keep things moving all require trained personnel who can serve today and propel the industry into the future. Study Business and gain the added value of specialized industry knowledge that will push your résumé to the top of the stack. ERAU offers a variety of Business options so students can choose to focus on airline or airport operations, finance, marketing, logistics, supply chain or project management, entrepreneurship, and more. Accelerated programs allow students to fast-track to a master’s degree. Faculty bring a wealth of experience and often author texts used in the classroom and consult within the industry, bringing research opportunities to Business studies. With Embry-Riddle’s fleet of aircraft, flight-training devices, labs devoted to ensuring safety in the skies, and flight instructors dedicated to student success, it’s no wonder our pilots set the standard for professionalism around the globe. Students seeking a career in the cockpit, even a virtual cockpit, will find a variety of options open to them, from fixed-wing to rotary, cargo pilot to airline pilot, UAS operator to mechanic—plan the path to a career in aviation with the leader. The Aerospace Engineering major at Embry-Riddle has been one of the most highly ranked in the nation for more than a decade. Building on this success, the Engineering offerings have expanded to Mechanical, Electrical, Civil, Computer, Software, and Engineering Physics, all ABET accredited. Additionally, an associate degree in Engineering Fundamentals is offered online to prepare students for full admission to a bachelor’s program, and online master’s degrees in Cybersecurity Engineering, Engineering Technology, and Engineering Management offer engineers advanced skills to enhance their career opportunities. The nation’s one and only College of Security and Intelligence, located at the Prescott campus, is focused on meeting the vital needs of the nation’s security and intelligence operations and exemplifies Embry-Riddle’s commitment to leading the industry. 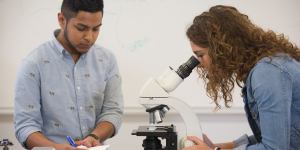 A variety of safety, security, and intelligence programs are offered through each campus, so whether students are interested in protecting our borders, ensuring workplace safety and efficiency, investigating aircraft accidents, pursuing a career in covert operations, or studying forensics, Embry-Riddle has a major designed to help you reach your goals. The lifeblood that powers every system relies on computers, software, and technology, and the need for professionals in the field grows almost exponentially each year. From the cell phone to the air traffic control system, computers and their systems drive commerce, transportation, communication—virtually every aspect of our lives. Whether your interests lie in software, hardware, cyber security, electrical engineering, or systems, Embry-Riddle’s technology-focused majors allow you to choose the track that will best prepare you for some of the highest-paying and critical careers of the future. The sciences that support air and space travel have advanced society in countless ways. 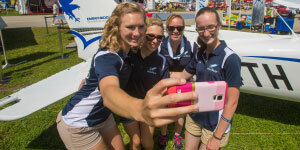 Embry-Riddle students continue to push the boundaries of knowledge in majors that lead to understanding the impacts of climate change and the long-term effects of gravity on the human body; apply mathematical algorithms for simulation and analysis; and lead to effectively communicating complex situations. Space travel has long been an obsession and fascination of the Earth bound. The challenges of designing aircrafts that can sustain the environments of inner and outer space, the communication devices that will keep us connected with space explorers, and overcoming the psychological effects of traveling in extreme environments are all areas of study at Embry-Riddle. One-of-a-kind majors in Space Physics, Engineering Physics, Spaceflight Operations, Human Factors Psychology, and Aerospace Physiology prepare students and graduates to overcome these challenges and prepare mankind for the next phase of flight. In a field focused on the future, research plays an integral role. At Embry-Riddle, opportunities to get involved with research start at the undergraduate level, where students are collaborating within the industry and conducting experiments in microgravity, hydroponics, virtual reality, biomechanics, gravity waves, and so much more. State-of-the-art facilities that include one of the only space simulators in the nation, advanced wind tunnels, and the LIGO Lab supporting the study of gravitational waves in space, along with internationally recognized faculty, lend support to student research. Internships, cooperative education, study abroad, and academic competitions add value to classroom studies and real-world experience to enhance marketability. Employers flock to Embry-Riddle because of the specialized knowledge and passion they find in our students and graduates. Industry leaders including Boeing, major airlines, NASA, SETI, Gulfstream, and Virgin Galactic are among the employers who hire Embry-Riddle students for co-ops and internships as well as full-time positions. Study abroad offers students experiences that encompass the global nature of our industries. Academic competitions allow students to apply technical skills in a team environment and students have engaged in international contests like AUVSI, EcoCAR, and Formula SAE. The Golden Eagles at the Prescott campus have placed #1 in the National Intercollegiate Flying Association’s annual SAFECON for 13 straight years. The needs of the aviation/aerospace industry continue to grow, and Embry-Riddle has been committed to helping to meet those needs for nearly 100 years. That’s part of the reason the University offers educational programs designed for students as young as seven years of age (through summer camps) all the way through professional programs designed for working adults. Academic degrees are awarded from the associate level through PhD programs, plus students can earn professional or FAA certifications that enhance employability. Learning options include traditional classroom study at our residential campuses or online offerings through the Worldwide Division. A massive open online course has been developed to expose prospective aviation professionals to the principles and practices that drive the profession. Explore Embry-Riddle’s Aviation 101 at aviation101.org. The largest university telescope in the state of Florida; the STEM Education Center that serves science, technology, engineering, and mathematics education throughout the state of Arizona; state-of-the-art wind tunnels; the MicaPlex Research Center; air traffic control labs; a high-altitude normobaric lab; aircraft accident investigation labs; a nonlinear waves lab; weather labs; and more—there’s a lot to show off! Explore the residence halls, campus eateries, and libraries, including special collections of aviation history, flight lines, and more. Make plans to visit one of our campuses or join us at an event around the country. Explore all our majors, labs, events, virtual tours, and admission information on our website.